Jeg har EN klage! Ikke om vejret. Ikke om priser. Ikke om meget mørke dage i vinter. Og ikke om dansk! Min klage er om husholdningsartikeler! Faktisk, kun EN husholdningsartikel... en at jeg kan ikke finde i Danmark og en at jeg kan ikke bringe fra Amerika-- min "CROCK POT"! I Danmark, kan du køber 37 forskellige friturer.... og du kan faktisk køber en elektrisk "kartofler skærer", men du kan ikke købe mands BEDSTE OPFINDELSER! Den en opfindelse at kan køge din aftensmad imens du arbejder, så når du kommer hjem fra en vinterdag ud i KOLD, MØRK Danmark, lugter huset ligesom lækker aftensmad! In Denmark, you can buy 37 different fryers....and you can actually buy an electric potato peeler, but you cannot buy man´s GREATEST INVENTION! The one invention that can cook your dinner while you work, so when you come home from a winter day out in COLD, DARK Denmark, the house smells like a delicious dinner! Min klage er ikke så stor..... men hvis nogen kan hjælpe mig med denne.... min "Positiv list om Danmark" vil har en mere ting på det... og min "Negativ list om Danmark" vil blive tom! My complaint is not so big.... but if someone can help me with this.... my "Positive list about Denmark" will have one more thing on it.....and my "Negative list about Denmark" will be empty! 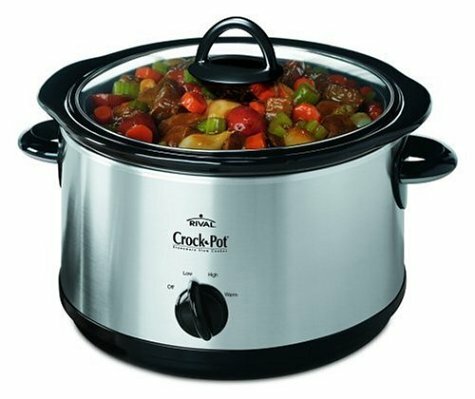 You can buy a Crokpot online from UK. They use the same 230V voltage as in Denmark and the rest of Europe, so you need any transformer. They just use different power plugs than in Denmark, but you can easily replace that with a Danish power plug or use an power plug adapter. wow a potato peeler... and yet not a crock pot to be found... odd... and yes mavs tickets well if you and meds wanna fly over here you can go but i did ask jessica if she wanted to trade he concert tickets for mavs and she said no... o well i tryed... so is it snowing yet??? I agree - totally and completely. I have also found a solution, though I haven't actually made the purchase yet. But, I'll give you the link! Yikes!! There aren't any suggestions yet...Kelli I hope someone can help you out! Sorry, I am of no help on this one. HAHAHAHA, you know, I ate a great dinner with my sister in Texas last summer and asked her how she made it- in a crockpot....well, crockpots are non-exsistent in Norway also, so I tried to think how I could compensate, I figured everything in a giant pot would be the best solution, only problem is you can't go from it. So going to work and coming home to a house that smells like dinner would be a no no.....you might come home to a house that smells like it caught on fire if you try my suggestion. But I loved the links given to find a crockpot here in Europe which might work here...so I've borrowed them myself and will see if there isn't a crockpot in my life sometime next year also. I've lived this long without, I can go a little longer, especially since money if flying out the window right now because of Christmas!!!! Hope you get your crockpot and life gets back on track!!! Oh and cheers to your positive attitude on living abroad. It's important to keep positive and open to new ways in order to live successfully overseas!!!! Good for you!!!! Just cross the border to Germany - they've got them there!!! Fingers crossed that one appears one day soon! I asked my German friend Sandra about slow cookers in Germany. She said they have them there. She also had a look on eBay Germany and said there were some. If I remember correctly, Mads speaks some German, so maybe you could try that. Shipping might be expensive...but if it's something you really want, then it's worth it. Hilarious! I too was saddened to leave my crock pot and my rotisserie behind. I even have box in the garage labeled "Things we can't plug in"
Maybe Santa will bring you one! Good luck, let me know how it goes! Our American family living here got their crock sent, but there will be taxes! We were given one and got rid of it because I am afraid of them, LOL! Good luck with your crock quest. I hear you! I used my crockpot all the time in the US. With no job, I have all day to cook, so I don't miss it as much. However, the convenience of throwing everything in the pot and walking away is so wonderful, I'm surprised the two-income Dane families haven't found the joy of cooking with a crockpot. I've seen them in Flensburg. You may have to take a road trip.